Promote your restaurant through rich media on the internet. Restaurant Guides provides far more than just a directory listing and potential customers have access to a detailed description of your restaurant and the full menu. 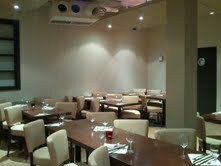 In addition, we show them photographs of the interior (taken by a professional photographer if required!) and even a 360 degree panoramic view so that the unique atmosphere of your establishment really comes across! Allow customers the ability to book a table at your restaurant online, either from a Restaurant Guides listing or from your own website (see below). We offer a range of booking services to suit your needs! Our team of highly skilled developers can advise and assist you in creating your own unique internet presence complete with all the high quality features today's experienced internet users expect. Interested? Please contact us to discuss your requirements or to request a media pack.